So there’s this picture of me. Standing next to the Spouse. It was Easter dinner. I’m wearing these old glasses that are a little too round for my face. And, even though it’s a family holiday dinner we’re hosting, we’re pretty casual. Many Easter dinners started on the back porch. Those early sunny spring Sundays have served up the first al fresco parties of the year. There was that IKEA set we had with the bargain wood table, two chairs and the bench. Then we got the metal chairs with comfy cushions to surround the mosaic tile table with the red and white awning-ed umbrella. The back porch served up our renewed love of pink wine. Our guests recoiled at the petal hue of that early rosé. The color that–back then–telegraphed sticky sweet wine. But not this one. It was French. It was dry. And it had stone fruit, actually peach, esters that surprised. I poured this beautiful wine and challenged our guests. There were olives and cheeses and I don’t know what else–maybe prosciutto wrapped honeydew?–providing culinary cover. So we got drunk before the crown roast of pork or salmon roudelade. This Easter, the one that I started talking about, the one in the picture, had me with my period glasses perched on my nose and standing next to the Spouse. My hair was unattractively pulled back in a way that kept it out of the meal but that did me no beauty favors. Like I was the before picture from a makeover. The point of this photo, when it was taken, was to display the wine. There’s me and the Spouse, like I said, and we’re holding an amazing bottle of French champagne between us. The wine with the super tiny, micro-fine bubbles. And the taste of toasted biscuits. And the color of diluted honey through a slightly bronzed lens. You might recognize this description as Cristal. And you’d be right. The Spouse was gifted this fine vintage bottle from an academy award winning director after a rare personal print that he lent was projected with great care. That’s what Hollywood folks do, I guess. Have a very expensive champagne shipped to a dirty projection booth. Legend has it that The Spouse was ready to pop the cork to share the nectar with his colleagues after the show when one of his staff stopped him. “No!” said he, “This is the good stuff. The stuff that the rappers drink. Share this with your spouse.” For this, I am forever grateful. So the rescued bottle was hidden in the basement for a bit, until that Easter when we had family over and popped the Cristal. We shared with the boys and compared it to another bottle of champagne we poured. There was a notable difference–even for the barely teens. On this day I was wearing my green sweater. I know because of the photo. I ordered the sweater online. 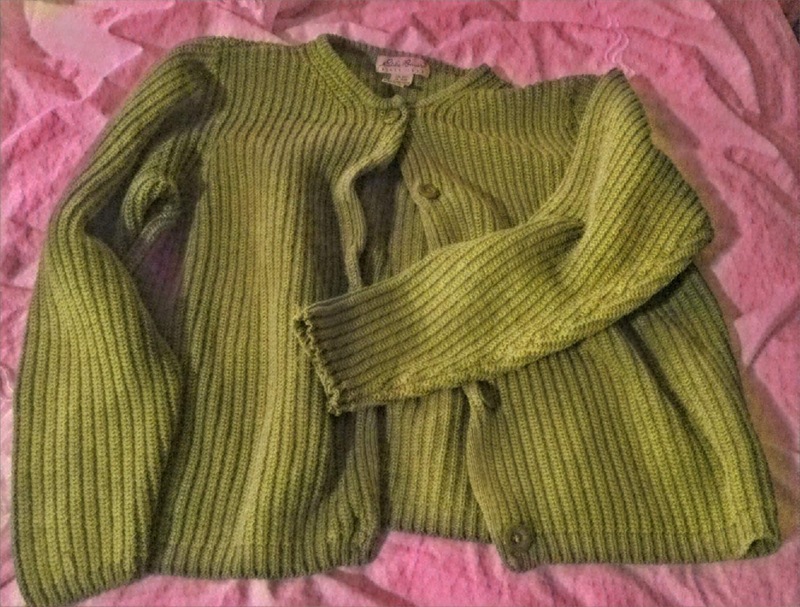 I chose two shaker stitch sweaters, one a medium olive green and the other an ocean blue. I also ordered the matching shells. The blue set was donated first. The green shell a bit later. But the green cardigan? That became my go-to wrap. From fall through the end of spring, I’d wear that heavy-stitched cotton warmer. I wrapped a decade of Christmas presents wearing it. I made about twenty-thousand-million pots of coffee with it over my shoulders. I checked homework and watched hours and hours and hours of Star Wars on repeat with the boys wearing this cape. When I’d get home, I’d take of my work clothes and don the green sweater. It was my house sweater. Like a Mr. Rogers-came-in-the-house sweater. Over the years I baked three or four cookie trays, oversaw 8-12 science fairs, popped four-thousand bowls of corn, read two hundred books, bought $58,726 in online merchandise on Amazon, listened to 60 million songs and paid a gazillion bills while wearing it. I didn’t really wear it much at all last winter. And also not so much the winter before. When I put it on this year it was misshapen. It was stretched out in weird ways, and shrunk in the most unattractive ways. The buttons didn’t align quite right, and the cuffs were a little frayed. I was parsing through my wardrobe, trying to do some purging before we have to move out. No reason to pack away or to move junk. You know? And my hands lifted the sweater to eye level. I saw what must be the grown-up version of a teen looking at a beloved stuffed animal. It meant so much. And it was time to let it go. It still brought me joy, but in the form of memories, not in function. I gave it a hug, like you’d give your scruff teddy bear, and placed it in the donation pile. Thank you, green sweater, for the years of joy. I will remember you always, like a fine, ephemeral champagne.